One of my recent photography class assignments was to emulate a favorite photographer. Hands down these days, my favorites are the photographer duo J. Shimon and J. Lindemann and I’m emulating their Herman Christel. They did their photo in 2002 as a gelatin silver print, a process that uses black-and-white film and printing paper coated with light-sensitive silver salts. My photo, of course, is merely an Epson copy. Gorgeous George was our neighborhood phenomenon for more than 40 years. 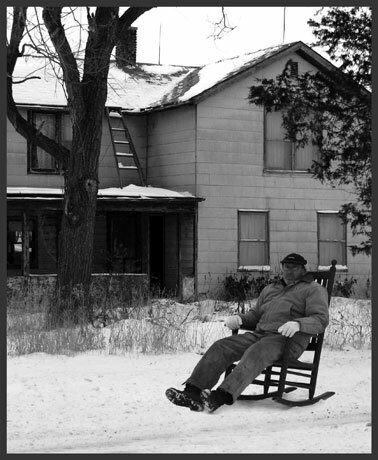 As the story goes, he and his family moved to the area from Iowa in the late ‘60s and, together with their seven children, lived and worked this farmstead. In years gone by, the house and yard were less kept than it appears today. Stacks of chopped wood filled the front porch from floor to ceiling. Decaying bales of straw, once having served as insulation, surrounded the foundation and likely served as home for any number of rodents. Old autos, farm machinery and miscellaneous parts rusted away in the yard. Legend has it that social services took George’s children away from the home due to it’s poor living conditions. Yet, George and his wife continued to live there many years after. George, an eclectic character with a long white beard, was resourceful and industrious. Neighbors often saw him pulling a wagon load of corn with his Volkswagon Rabbit or hauling water from an artesian well many miles away. George and his wife no longer live in this house. The farm’s been sold. The machinery’s been hauled away. The house, now empty and deserted, actually looks better than it has in a long time. And George, portrayed in this picture by another man, supposedly lives in an area institution. John Shimon and Julie Lindemann are Wisconsin photographers who “have made a career using antique cameras, modern lens technology, artificial light and contemporary pop culture to create portraits of people in their native state,” as biographed by the Milwaukee Art Museum (MAM), where their Unmasked and Anonymous exhibit was recently featured. Shimon and Lindemann met as art students at the University of Wisconsin-Madison in the early ‘80s. After a brief stint in New York, the pair returned to Wisconsin. They now work from a 19th century warehouse storefront building in downtown Manitowoc. Their work has been showcased in galleries, magazines and books throughout the U.S. They also work as art instructors at Lawrence University in Appleton. I was fascinated by Shimon and Lindemann’s exhibit at the MAM. Their work captures the unique and interesting characteristics of everyday people, transforming them into icons of our fascination. I especially love the narratives they include with the portraits. These stories attest to the relationship the photographers build with their subject and ultimately the success of the portrait.